Irrigation systems in Howell need regular maintenance to keep them working efficiently year after year. Damage from lawn equipment or improper winterization can cause leaks and other serious problems. Inspect your system monthly. 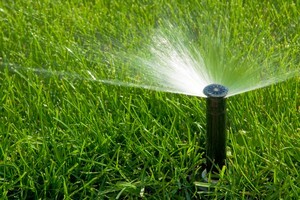 Check for leaks, broken or clogged sprinkler heads, and other problems. Clean clogged screens and microirrigation filters as needed. Adjust sprinkler heads. Remove or correct obstructions that prevent sprinklers from distributing water evenly. Adjust sprinkler head positions and spray patterns to avoid watering sidewalks or structures and to provide necessary clearance over growing plants. Check the pressure. Pressure can change over time and negatively affect system efficiency. Inspect the system for leaks. Leaks are a huge water waster. A good contractor can perform regular maintenance checks for leaks, broken or clogged spray heads, and other problems. Ask them to show you common problems to watch for between visits. Install a rain shutoff switch. These inexpensive sensors can be retrofitted to almost any system and help compensate for natural rainfall by turning off your system in rainy weather. Consider “smart” technology. Climate or soil moisture sensor-based controllers evaluate weather or soil moisture conditions and then automatically adjust the irrigation schedule to meet the specific needs of your landscape. Consider low volume, microirrigation for gardens, trees and shrubs. Drip (or trickle) irrigation, micro-spray jets, micro-sprinklers and bubbler irrigation all apply a very small amount of water, slowly and precisely, minimizing evaporation, runoff and overspray. Have your system audited. Hire a professional to conduct an irrigation audit and uniformity test to verify areas are being watered evenly and appropriately, and make necessary adjustments. Look for savings. Many water utilities offer rebates for certain water-efficient products. Before upgrading your new system, consult with your local water provider. Winterize in colder climates. An irrigation contractor in Howell with specialized equipment will flush out water that could freeze and crack pipes, valves and sprinklers. If you are looking for a professional Howell Irrigation Contractor, please call us at 734-564-1373 or fill out our online request form.